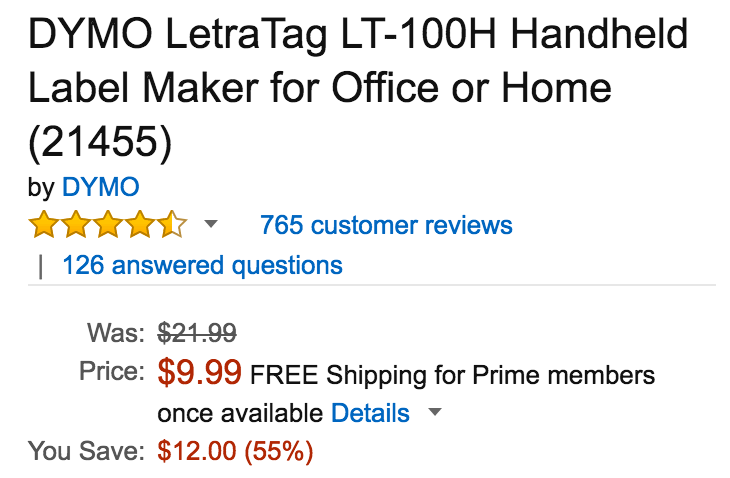 Amazon offers the DYMO LetraTag LT-100H Handheld Label Maker for $9.99 Prime shipped. Also at Staples. That’s a $20 savings off the original price, down $15 or so from the regular going rate and a match of the Amazon all-time low. Rated 4.4/5 stars by 765 reviewers. 13-character LCD screen and graphical display on this label printerlets you see messages, and font and effects on-screen before printing. Automatic-off saves power. easy-to-navigate, quick-access buttons for swift and easy label making. Hand-held and sleek, with battery powered portability, the DYMO LetraTag Plus LT-100H Label Maker is the perfect way to keep your home organised. With a wide array of label colours and text features like multiple font styles, underlining, bolding and text sizing, you can print the right label for almost every situation. And the graphical display shows you precisely what you’re going to print. 3M post-it sign & date flags. We take great pride in enabling people to realize their full potential. That’s because we are dedicated to going beyond the essentials to better serve you, ultimate creating a stronger community.